On a recent trip to London, I had a truly amazing dinner at a Pan-Asian restaurant. While the noodles and flavors were outstanding, I found the dish a little bland and asked for some hot pepper. Instead they brought me some hot chile oil, which ended up being, by far, the highlight of the meal. And maybe even the entire trip. It was seriously that good. Not only did it have some heat to it (without being obnoxiously spicy), but it had an earthy flavor and depth I just couldn’t get enough of. I dumped ALL of it onto my remaining noodles and mopped up the rest with whatever appetizer was still left on the table. 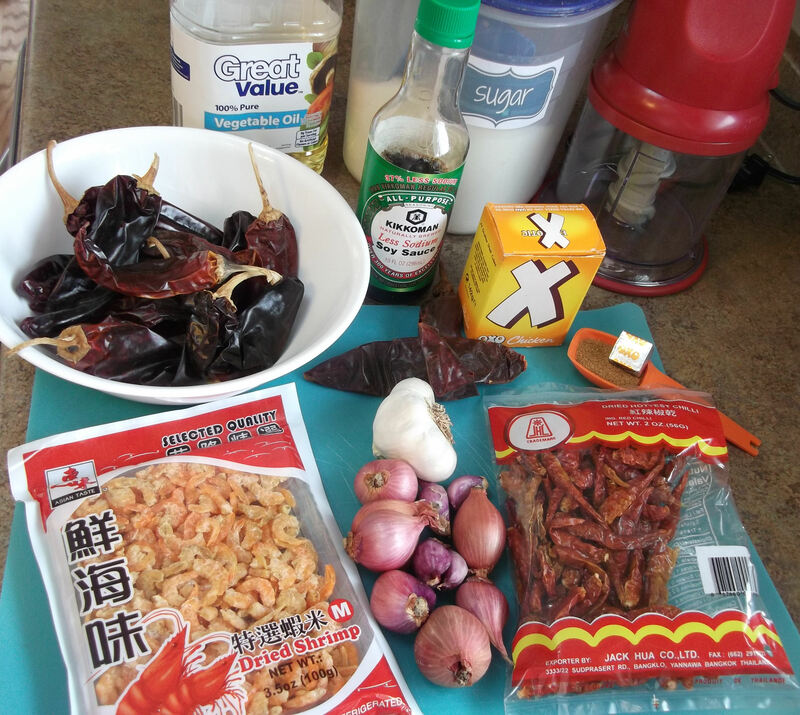 Our server had the chef write down some key ingredients (including hot chiles, dried shrimp and garlic), but since he didn’t give me an exact recipe, a brief Google search of those ingredients led me to recipes for Cantonese chile oils. I skimmed over several recipes and ended up creating my own, which was most closely adapted from this one. Measurements and quantities varied widely among the recipes, so even though I measured things exactly for this one, don’t worry too much about exactness. Worry instead about thinking up all the different things you will douse with this delicious oil! 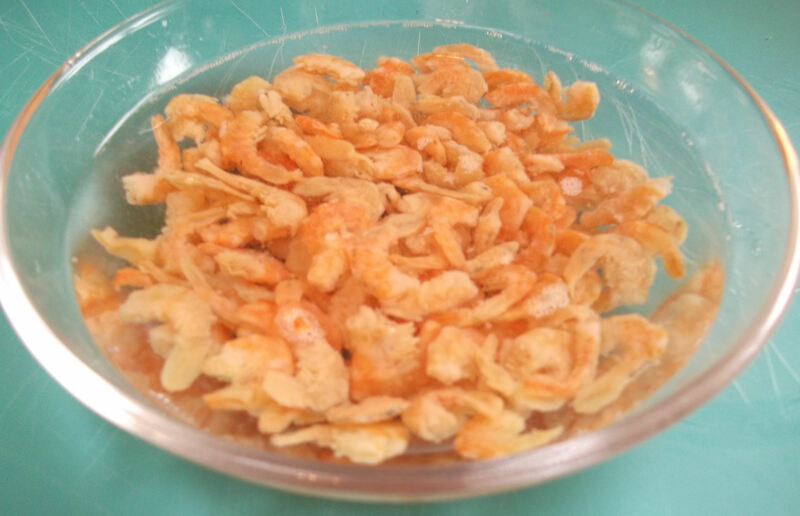 Place the dried shrimp in a bowl and cover with hot water to soften; set aside. 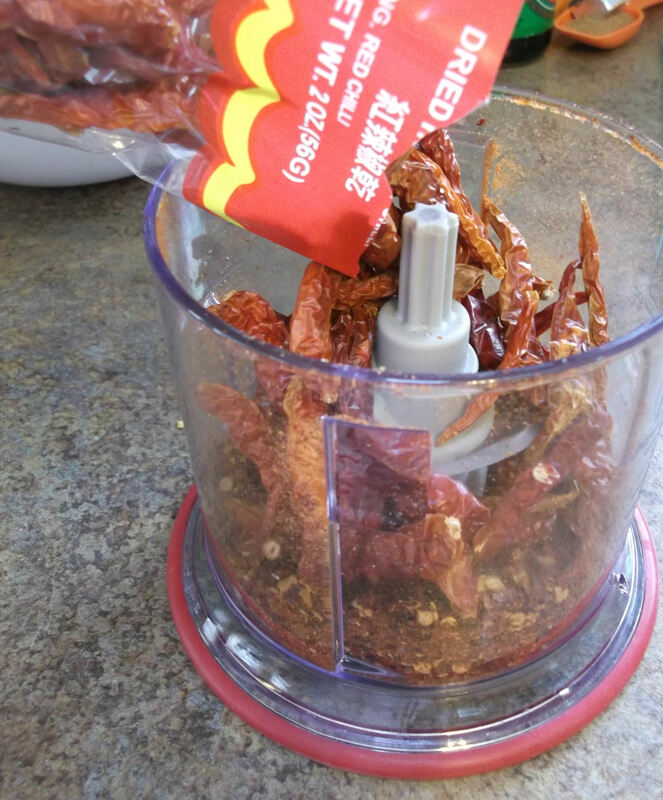 Trim stems from the dried chiles, chop coarsely and place the chiles and seeds in the food processor. Don’t pack them in: when full, process on high until well chopped and uniform in size (they will resemble commercially packaged crushed red pepper flakes). 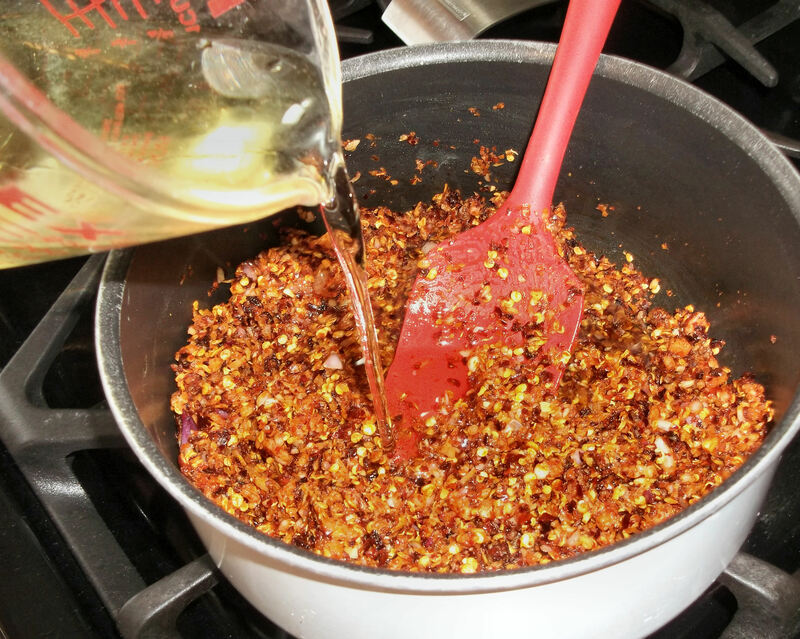 When all chiles have been processed, there should be just over 1 C of crushed red pepper. Smash and peel the garlic cloves, peel and coarsely chop the shallots, and then drain the water from the shrimp. 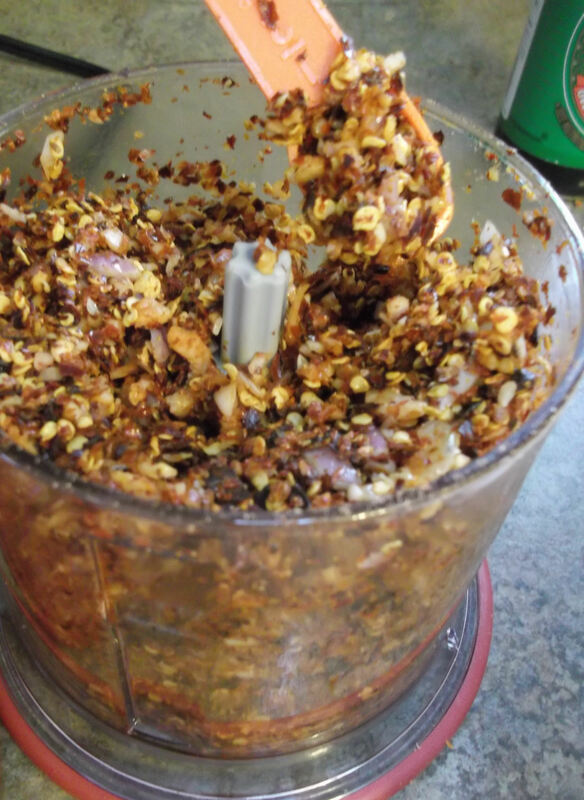 Place the garlic, shallots and shrimp in the food processor with the crushed red pepper and process the mixture until it has a coarse, even texture. In a large, deep pan over medium heat, add enough cooking oil to coat the bottom. Add the sugar and chicken stock powder and stir until dissolved. Add the red pepper mixture and 1 to 1½ C of the oil; stir well to combine. Cook until the mixture bubbles, then reduce heat to low/medium-low and cook, uncovered, at a gentle simmer for 20-30 minutes, stirring occasionally to prevent sticking or burning. Taste the oil add salt and/or soy sauce as needed. When the mixture is fragrant and has turned darker red/brown, remove the pan from the heat. Stir in remaining oil to reach the desired consistency and flavor. Allow to cool, then spoon into clean bottles or jars. The oil will last several months in the refrigerator. 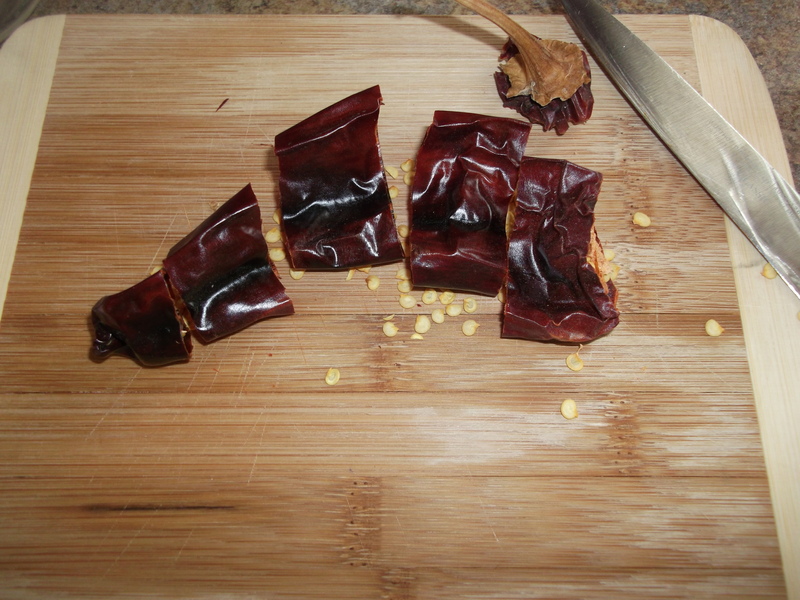 If your grocery bag isn’t full yet, pick up some dried red chiles, too. When I made this, I used a 2 oz package labeled “Dried Hottest Chilli” along with 2 oz (10-12 pods) of dried red chiles from New Mexico. Place the dried shrimp in a bowl and cover with hot water to soften; set aside. Wearing gloves, trim stems from the dried chiles and chop coarsely: just enough so they fit more easily in the food processor. 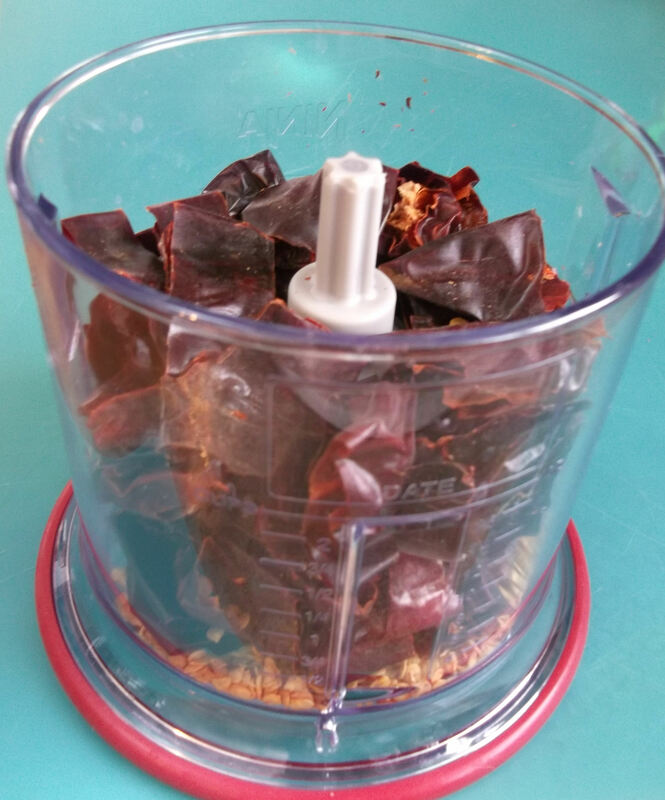 Place the red chiles — and the seeds — in the food processor. Don’t pack them in: when nearly full, process on high until the chiles are well chopped and uniform in size (they will resemble commercially packaged crushed red pepper flakes). 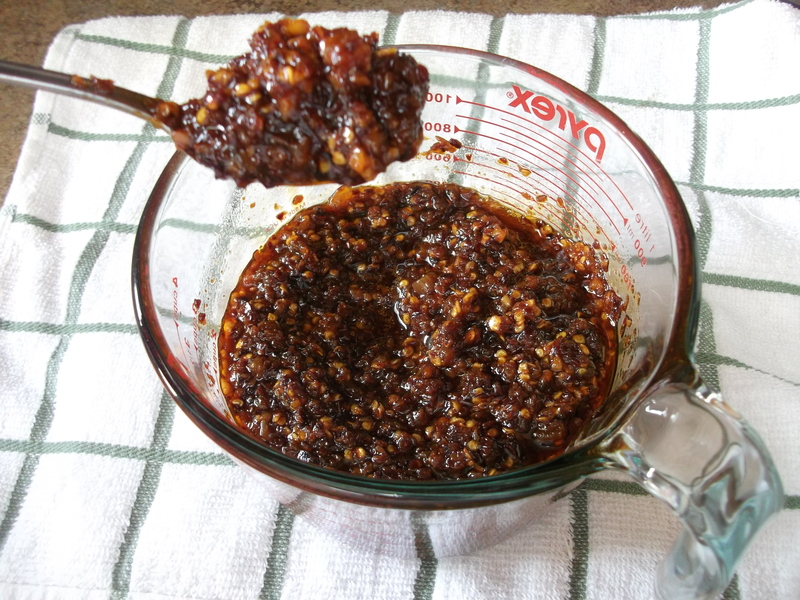 Keep adding chiles until they have all been processed; there should now be just over 1 C of crushed red pepper. 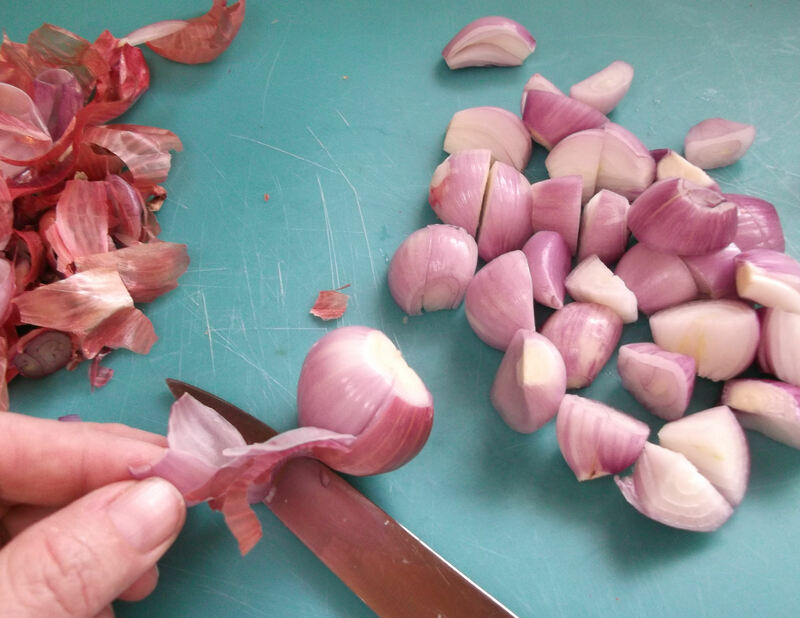 Smash and peel the garlic cloves, and peel and coarsely chop the shallots: just so that they are about the same size as the garlic cloves. Drain the water from the shrimp, and place the garlic, shallots and shrimp in the food processor along with the crushed red pepper. If you know you will use soy sauce and/or salt, go ahead and add some of that in now, too. Process the mixture until it has a coarse, even texture. It will be pretty dry and crumbly. In a large, deep pan over medium heat, add enough of the cooking oil to coat the bottom. 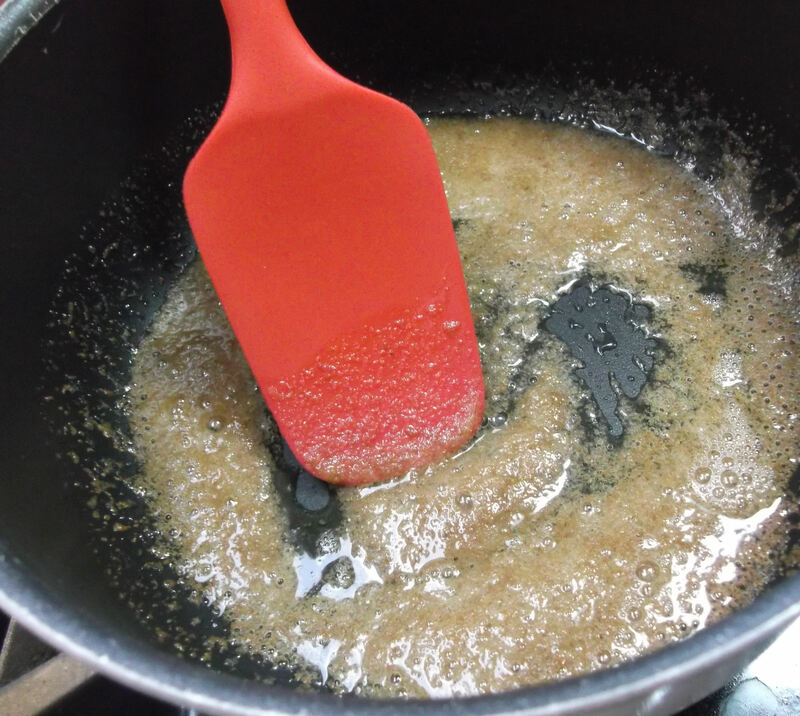 All you need is enough to dissolve the sugar and chicken stock powder: add those to the oil and stir until dissolved. 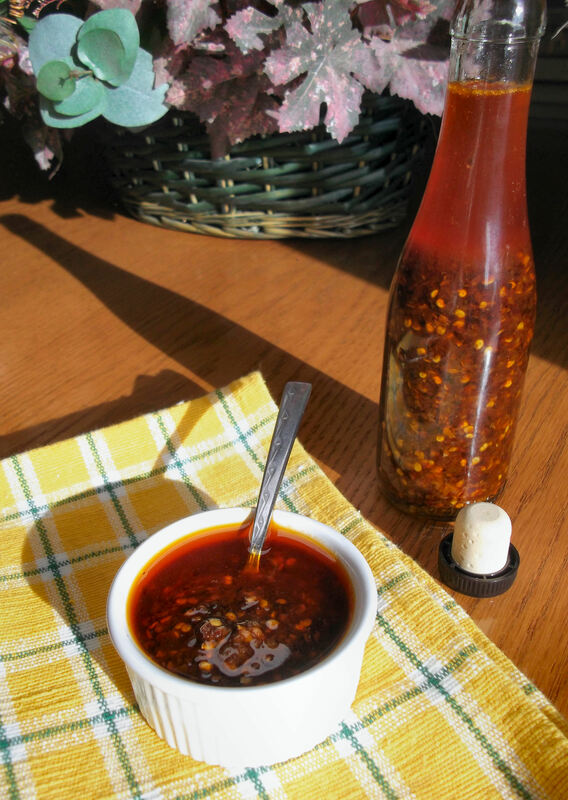 Add the red pepper mixture and then about 1 to 1½ C of the oil; stir well to combine. Cook until the mixture bubbles, and then reduce heat to low/medium-low and cook, uncovered, at a gentle simmer for 20-30 minutes, stirring occasionally to prevent sticking or burning. 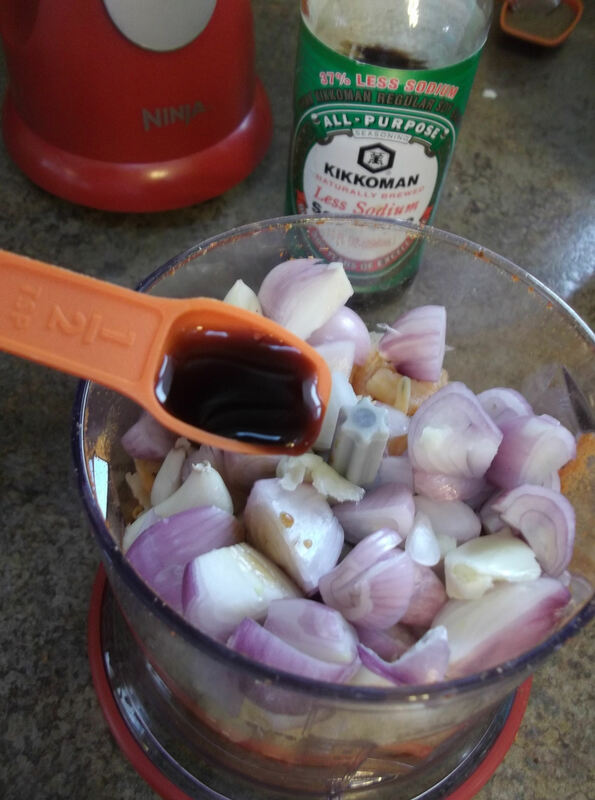 While the mixture simmers, taste it occasionally (careful: it will be both spicy-hot and temperature-hot) and add salt and/or soy sauce, if using, in about ½ t increments. I found that it was rather bitter and lacking the depth of flavor I was seeking until I used about 1½ t of each. But then, I used a low-sodium chicken stock powder (not sold in the US), so your results may vary. 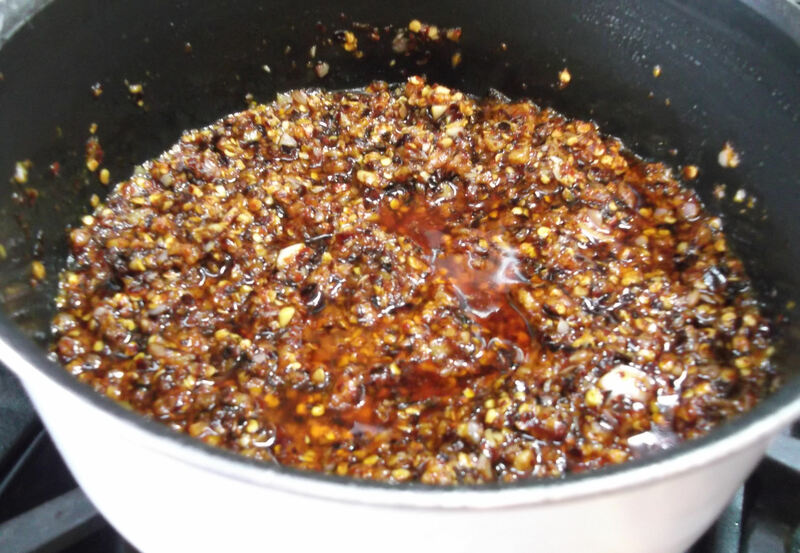 Once the mixture is fragrant and has turned a dark red/brown color, remove the pan from the heat and stir in enough of the remaining oil to reach the desired consistency. At first, the mixture was chunkier in texture and pretty ridiculously spicy hot. Nothing wrong with that, if that’s what you want. 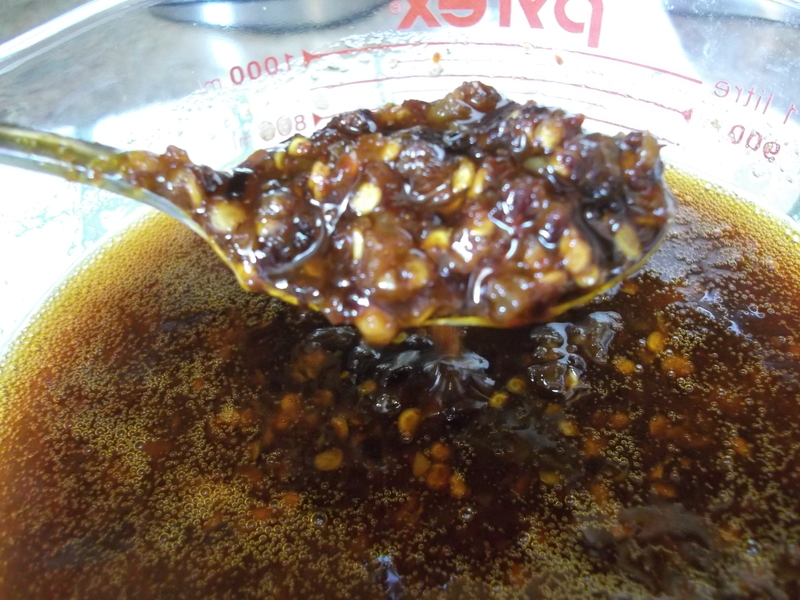 After adding more oil (another 1 to 1½ C), it became smoother in texture and the spiciness was diluted a bit. Don’t get me wrong – it still packs a punch and should be used sparingly at first, but this texture, for me, was a little more appealing. Allow to cool, stir well again (the oil tends to rise to the top and needs to be mixed back in), and then spoon into clean bottles or jars. 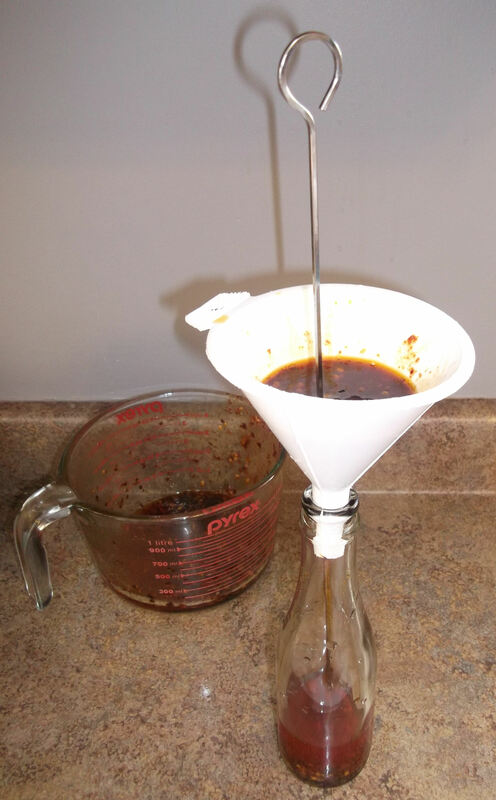 Note: if putting this into a bottle, use a funnel with a skewer to stir/poke the solids down. It will take a little time and effort: it’s pokey (pun fully intended), but it will eventually fill up. 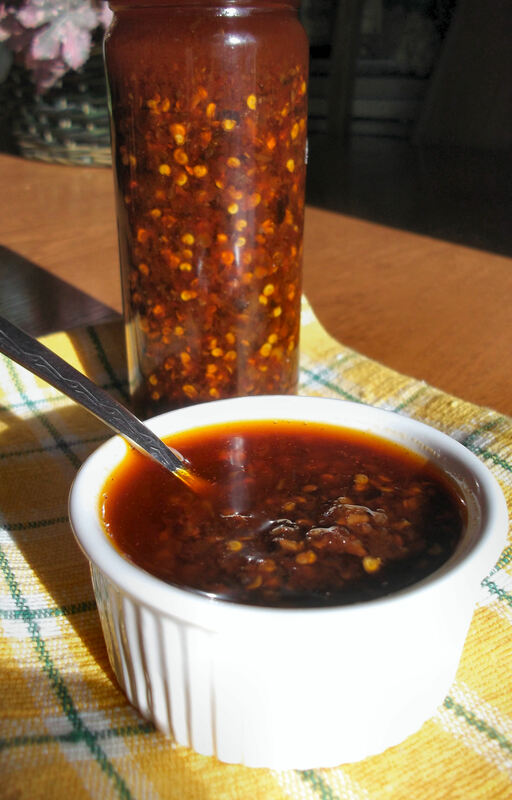 Use the oil, along with its flakes of crushed pepper, as a condiment for just about anything that needs a little kick. The chile oil should last several months in the refrigerator. Enjoy!